Diamond Lake Slips – Permission slips for the snow trip to Diamond Lake are due TODAY! Without exception, your green slip must be turned in to Peggy or Mrs. Lind by the end of the day. Make a phone call home if you have to to have your grown up bring it in. No “over the phone” permissions are accepted – we must have the green slip. Remember to plan ahead for snow; boots, coats, snow pants, hats, gloves, etc. for Thursday’s trip! March of Dimes – FBLA have given your first period teachers a donation box for the March of Dimes. Bring in any loose change and donate it to a great cause for research and programs to help prevent premature birth, birth defects and infant mortality. The class with the most funds donated will win a donut party and their teacher will win a gift basket! Spirit and Pride – The goal is to have our halls filled with spirit and pride on Wednesdays and at our home athletic events – so get your t-shirts/sweatshirt orders in by Friday this week. You can also order your swag online where there are more styles and options. Lady Hornets – The lady hornets have their games at Jo Lane this afternoon against the Jo Lane White teams. Ladies, your game bus will be leaving at 3:00pm and we wish you the best of luck at Jo Lane today. 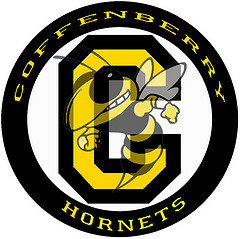 Hornet Wresting – Our hornet mat crew will be heading up to Winston today to take on their wrestlers. Crew your bus will be leaving at 2:30 with the first wrestlers taking the mat at 4:00pm. What’s for lunch today? Chili and chips or variety bar choices. 7th graders, your choices in behavior in your classes yesterday was less than satisfactory – therefore you will not be going to lunch five minutes early today.